We’ve found an intersection in Dublin’s city centre that appears to be particularly dangerous for cyclists. 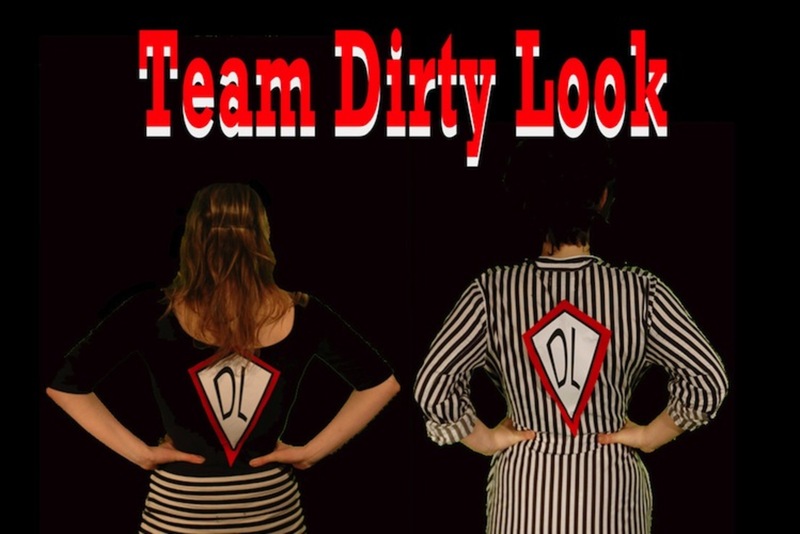 And we have some ideas on how to improve it. On 20 October, we posted a map designed to crowd-source information on bicycle collisions and near-collisions that might otherwise have gone unreported. Our hope was to identify problem areas and bring attention to them. Since then, there have been 139 submissions to the Dublin Inquirer Bicycle Collision Tracker map. Patterns appear to be emerging. 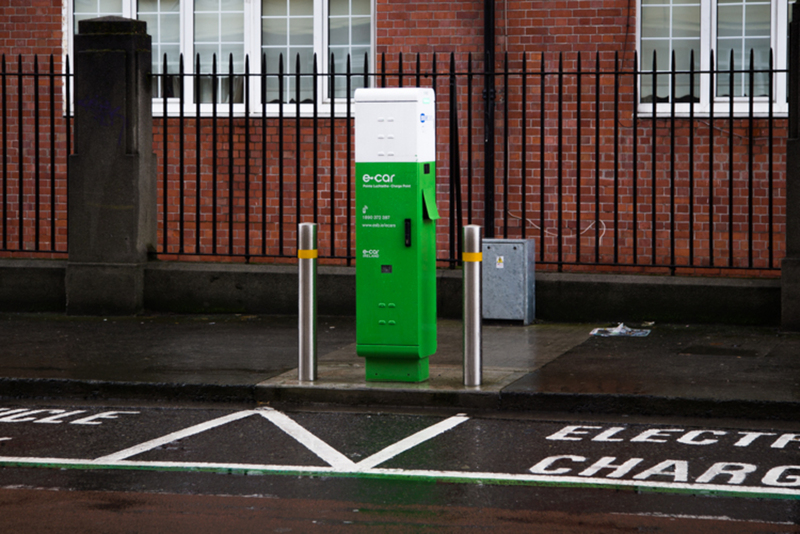 There is a discernible cluster of reported incidents in the city centre, and it’s only a stone’s throw from Dublin City Council’s Civic Offices at Wood Quay. Two accidents have been reported at the intersection of Bridge Street and Cook Street, and three more just south of the intersection on Bridge Street Upper before it meets High Street. We caught up with one of the respondents and talked with him about his near-collision on Bridge Street Upper, just south of its junction with Cook Street. Farrell says he cycles the route routinely and never feels safe going up the steep hill alongside St Audoen’s Park. “I just find that motorists are generally quite aggressive there because they’ve been stuck trying to get over the river,” says Farrell. The problem is, there is no cycle lane on Bridge Street. 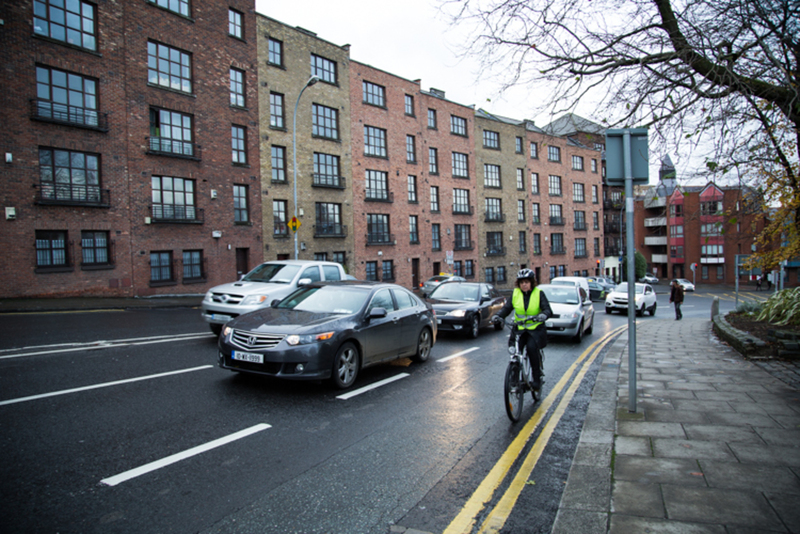 We visited the intersection in question with Colm Ryder of the Dublin Cycling Campaign, to get his take on what makes it such a dangerous area for cyclists. “There are absolutely zilch – no facilities whatsoever for people cycling,” says Ryder, who points out that it is the same for walking. Only one of the intersection’s four pedestrian crossings is signalised to help provide those on foot safe passage. “There’s no filter for the right-turners, so they’re always trying to break in to get across traffic,” says Ryder of traffic turning off of Lower Bridge Street, onto Cook Street. Traffic was at a crawl approaching the quays when we spoke. 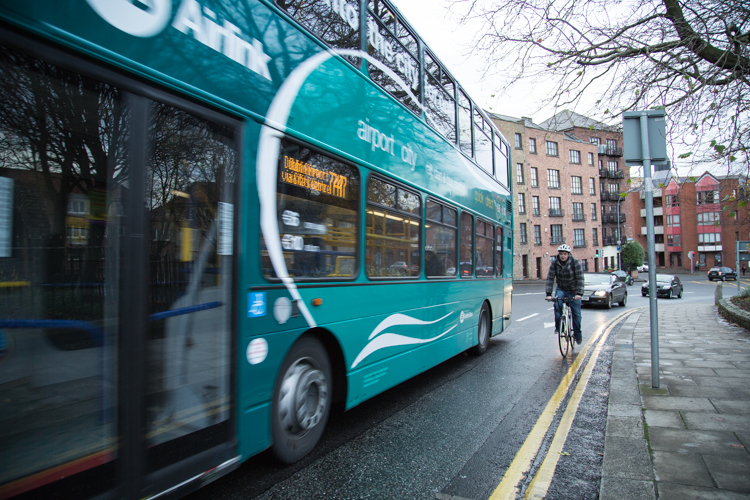 Ryder said that when traffic moving north towards the quays on Bridge Street is at a standstill, southbound cars turning right onto Wormwood Gate may not see a cyclist coming down the hill, and might make the turn. If a cyclist isn’t wise to the danger, she or he could ride straight into trouble. As far as Ryder is concerned, the junction is an example of bad design. It’s not just cycle advocates who would say this intersection and its surroundings are inadequate. If you flip to page 104 of Ireland’s own Design Manual for Urban Roads and Streets (DMURS) and look under the “Junction Design” heading, you will see there is a lot of work to do. The first design principle simply states, “provide crossing on all arms of a junction”. With only one crossing out of four arms provided for at this particular junction, we are not off to a good start. How sharp or gentle the curve of a street corner is influences how fast cars travel around it according to DMURS. As Ryder indicated, the corners of this particular intersection are quite gentle and allow cars to take the turn really fast. The next key design principle for traffic junctions, according to DMURS, is to “reduce kerb radii”, which is a fancy way of saying replace that gentle curve with a sharp corner. Doing so not only slows turning vehicles, but reduces crossing distances for pedestrians and makes it easier for drivers, cyclists and pedestrians to see each other. 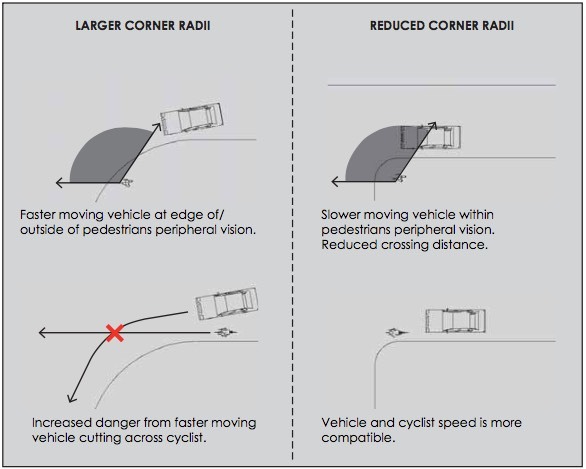 The sketch below illustrates how corner radii can affect a junction’s safety. The next design principle has to do with omitting left turn slips, which DMURS describes as “highly disruptive for pedestrians and cyclists”, without adding much vehicle capacity. Our junction has a left-turn slip from Cook Street onto Bridge Street Upper, just before the spot where Farrell was run off the road. It looks like Ryder’s description of this junction as a disaster is backed up by DMURS, but where do we go from here? As the Cycling Campaign’s Ryder sees it, the junction at Bridge Street and Cook Street is one of the many junctions in the city centre that are dangerous for cyclists and pedestrians. Many of these problem junctions are a legacy of a time when road design was aimed at maximising throughput of motor vehicles at the expense of pedestrian and cyclist safety. “The obvious thing to do here is to have a decent cycle track with a single wide carriageway in both directions,” says Ryder. 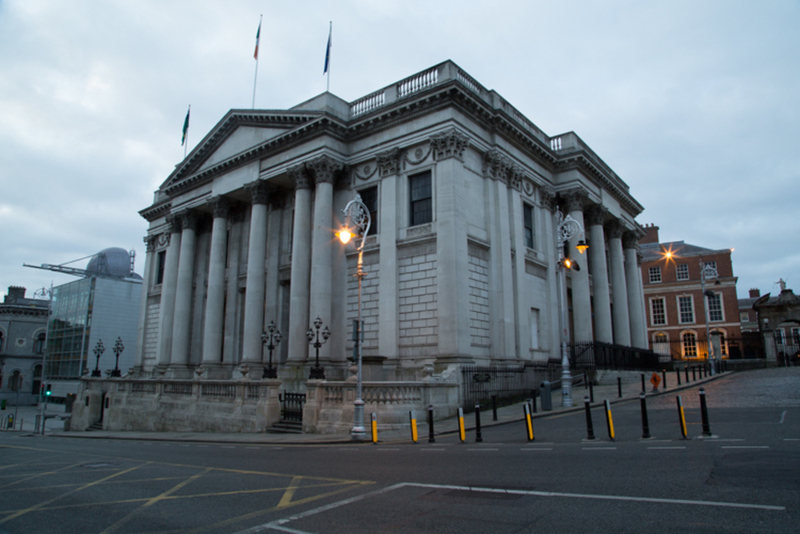 Although he is critical of this intersection, Ryder is far from a cynic when it comes to Dublin City Council. “They [city council] want the city to be a better city,” he says, adding that council officials have made it clear to the Cycling Campaign that better infrastructure for pedestrians and cyclists is high on their agenda. Are you a cyclist who has been involved in a collision or near-collision? Log it on our bicycle collision tracker here and help us map out where improvements need to be made. UPDATE: This article was updated on 2 December at 14.58 to highlight that the new post at city council will be an advocate for cyclists and pedestrians. Apologies pedestrians for the oversight. The problem is not just one for cyclists and pedestrians but for car users as well. The free for all starts right back on Church Street with no lane indications from the Luas crossing as to which lane should be used to get where. 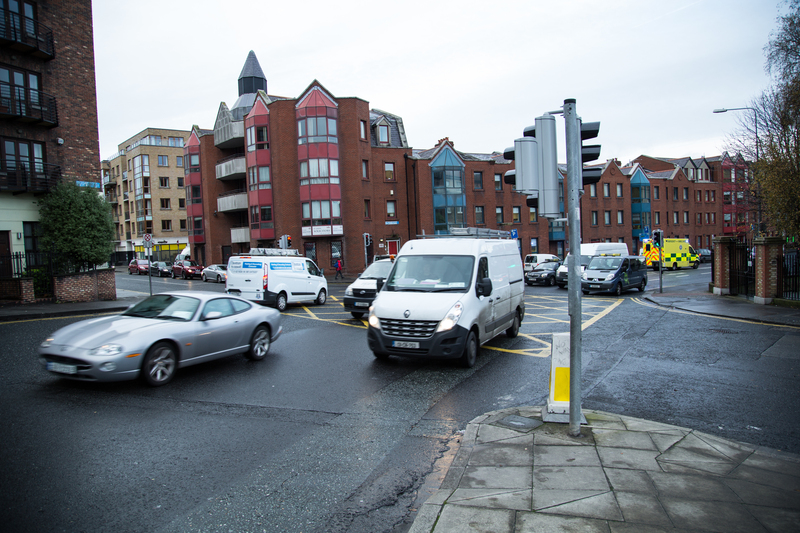 Drivers intending to cross the river can either take the left hand lane, and then find themselves trapped if they need to turn right into the Liberties either half way up the hill or at the top, or even if they are intending to turn right down Patrick Street, or the right lane, and find that they have to wait through several lights to cross the bridge. Separated pedestrian and cycle lanes, and clearly marked car lanes, if necessary with overhead signage even if it does mess up the view, are needed if we aren’t going to see fatalities. And yes, of course we need pedestrian crossings at both sides of the bridge. I don’t cycle since my knees died of old age but I regularly drive and walk this area and I really don’t see why some effort can’t be put into sorting it out, given the very high volumes of traffic that cross the river here.